The hot real estate market in south Florida continues, and both investors and residents look for the best values and options. Finding a property near the ocean in a highly desirable area for under $700K is a rare opportunity for the savvy investor. Palm Beach, Florida, September 8, 2014	(Newswire.com) - For buyers and investors interested in properties located near south Florida's beaches and ocean at prices under $1-million, this is a rare opportunity. This home is perfect for either full-time living, seasonal getaways or winter rentals as an investment property. According to realtor Steven Presson, "This property is situated just a short walk from the beach and ocean, this 2000-SF duplex with 3-BR/3-BA can be a wonderful winter getaway home, or for investors, a highly flexible, leasable rental property." This charming home features CBS construction, ceramic tile flooring, a large 17’x20’ eat-in kitchen with pantry, central air and 3-roomy bedrooms all on one floor. The garden view is beautiful, and the attached carport has plenty of room for 2-cars. Located in the highly desirable town of Ocean Ridge, this would be a wonderful winter getaway home, and also offers liberal rules for seasonal rental with monthly rentals permitted with minimum stays of just 30-days – a great rental investment opportunity during the winter months up north. Ocean Ridge offers fabulous dining, shopping and accessibility to the nearby towns of Boca Raton, Palm Beach and is just a short drive from the airport. There are bike and walking paths throughout the area, as well as easy access to the sun-drenched beaches and boating marinas in neighboring Boynton Beach. To schedule a personal showing of this or other Palm Beach County listings contact Steven Presson, one of Palm Beach's most successful realtors at 561-843-6057 or go to his website at www.stevenpresson.com. Steven Presson is one of the top 10-realtors in Palm Beach & is rated in the top 3% of all real estate sales professionals in the USA. He's with the Corcoran Group, a leader in luxury real estate markets in NY City, The Hamptons, & Palm Beach, FL. 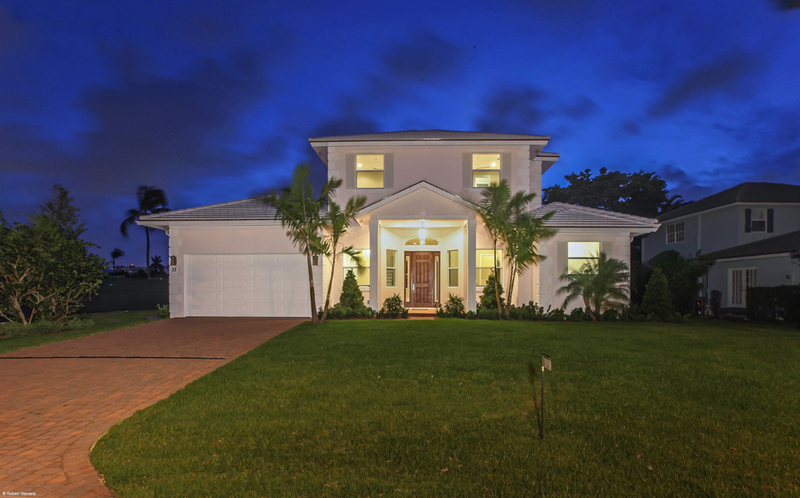 Ocean property like this custom-built 3100-SF home w/deep-water dock are in high demand. Investors seek neighborhoods with features great floor plans, new or remodeled kitchens, and upscale neighborhoods in small towns like Ocean Ridge. Steven Presson, recently rated among the the top 3% of realtors nationwide is proud to announce his new website: www.stevenpresson.com. His website is in keeping with his standard as technologically advanced and highly professional. This magnificent 8900-SF home, in the exclusive town of Gulf Stream, offers the best of everything in design, convenience and amenities. It will appeal to the discriminating buyer seeking a life of luxurious living and fabulous entertaining.